Jenny Jen42: Happy 4th. Weekend!! Going to spend the day with the family in Catonsville and do the 4th. on the 3rd. cause that's how Catonsville rolls. Gonna eat crabs, watch the parade with my favorite Boumi temple guys and then back for more eats and the fireworks! To commemorate this day..here's a pic of my sister and I on the 4th in the same backyard that we're going to spend today! 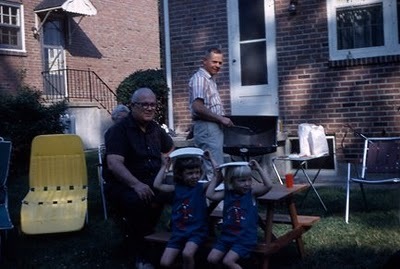 Loving my dad and pop pop pics here too!